Ships from and sold by Red Rhino. 250 Page Recipe Journal 8.5 x11 inches. Calling Foodies, all levels of cooks, chefs, students and could also serve the home cook wishing to start up a Cottage Food Operation. Write down or glue in 100 Recipes directly to the traditional pre-formatted recipe sheet and apply the name of the dish in to the Table of Contents. Option to calculate the cost of your ingredients for all 100 recipes.Tabs for organization with the option to tuck in to the book. Additional information included professional kitchen knives & specific use for each knife. - Sections on grains, spices, herbs, measurements, - Vendor directory to add in your suppliers. 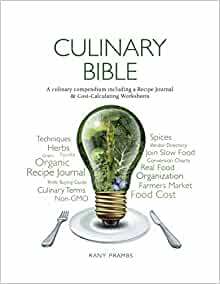 - Culinary Bible has been produced and printed in U.S.A. Low carbon footprint.